Lichterklang - Changes, Fire + Ice BLOOD AXIS / ANDREW KING The Dream / Fröleichen so well wir 7"
Startseite » Katalog » Neofolk / Dark Folk » BLOOD AXIS / ANDREW KING The Dream / Fröleichen so well wir 7"
The 1st new track by Blood Axis after many years, here sharing a 7" with the English ballad singer and radical traditionalist Andrew King. The unifying theme of this release is the poetry of the German Middle Ages. 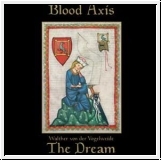 Blood Axis interprets a startlingly modern existential lament by the Minnesinger Walther von der Vogelweide (12th-13th centuries), who is considered to be the most important German-speaking poet of the period. Andrew King interprets a tortured love song by the Austrian figure Oswald von Wolkenstein (14th-15th centuries). Both lyricists can be seen as examples of a distinctive and long-enduring southern Germanic courtly poetic tradition. Unique to each track is the fact that the modern artists are presenting songs in the original "Mittelhochdeutsch," or Middle High German, the language spoken during the time of the Hohenstaufen emperors and an ancestor of modern German. It is fascinating to hear how well both interpreters are able to pronounce this difficult old language, and how closely their own music suits these painfully romantic lyrics from other times and places. An outstanding release that shows how it is possible to work with tradition in a way that is both illuminating and entertaining. The cover features the famous medieval portraits of the poets Walther and Oswald, and a detailed insert sheet provides the original lyrics along with faithful translations into modern English by Michael Moynihan.